The Tar Heel Circle invites you to a luncheon discussion about issues impacting North Carolina with special guest and speaker Rep. David Price (NC-04). The Tar Heel Circle invites you to a luncheon discussion about issues impacting North Carolina with special guest and speaker Sen. Thom Tillis (R-NC). Join us for our annual Seafood Festival at the Hill Center. More details TBA! Our NC Princess is Emily Sullivan from Carteret County. She is a junior majoring in international policy at American University, and is interning in the office of Senator Thom Tillis. Join us at Mission Navy Yard for our annual ACC Tournament watch party! Price includes all you can enjoy beer, wine, and well drinks as well as appetizers. The Tar Heel Circle invites you to a luncheon discussion about issues impacting North Carolina with special guest and speaker Rep. Mark Walker (NC-06). The Tar Heel Circle invites you to a luncheon discussion about issues impacting North Carolina with special guest and speaker Senator Richard Burr (R-N.C.). This private luncheon is at the Capitol Hill Club and open to the NC Congressional Delegation and THC members. Please join us for our annual BBQ, Bluegrass and Beer Festival, with live music, an open bar, great company, and all-you-can-eat Carolina 'cue! 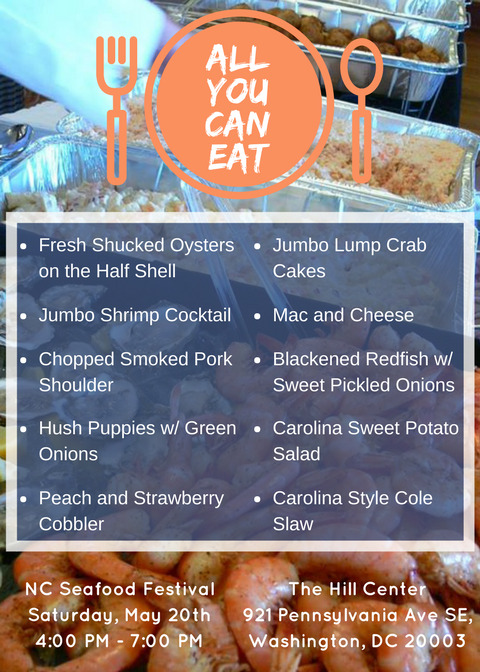 Please join us for our annual NC seafood festival with live music, an open bar, great company, and all-you-can-eat seafood from the Carolina coast! The Tar Heel Circle invites you to a luncheon discussion about issues impacting North Carolina. This private luncheon is at the Capitol Hill Club and open to the North Carolina Congressional delegation and THC members only. The Tar Heel Circle welcomes honored guest Rep. Alma Adams (NC-12) for a luncheon discussion about issues impacting North Carolina. This private luncheon is at the Capitol Visitor Center and open to THC members only. Starting at $20 for Grandstand Seating. The Tar Heel Circle welcomes Stephen Moore, CNN Economist and Panelist, for a luncheon discussion about the national & North Carolina economic outlook . The Tar Heel Circle welcomes honored guest Rep. G. K. Butterfield (NC-01) for a luncheon discussion about critical issues facing North Carolina.